For this Traditional Mexican Seafood Soup Recipe, the cook’s work is quite simple.Mexican seafood soup is a medley of fresh seafood floating in vegetables and tomato flavored broth.This soup is filled with a variety of tastes and textures, from Flaky Fish to Meaty Shrimp and tender squid or octopus.Mexican Seafood Soup is one of the easiest, most impressive ways to celebrate. It can be economical too. 6 guajillo peppers, seeded and kept in hot water until soft. You can control how spicy the food will be by the type of chilli peppers and the amount used. 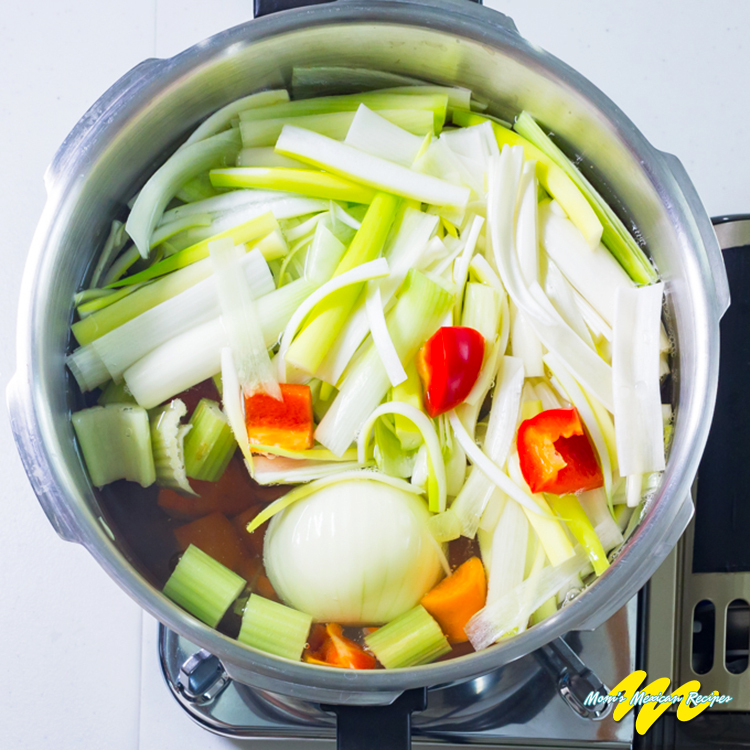 In a large pot bring the 8 ingredients for the broth to a boil. 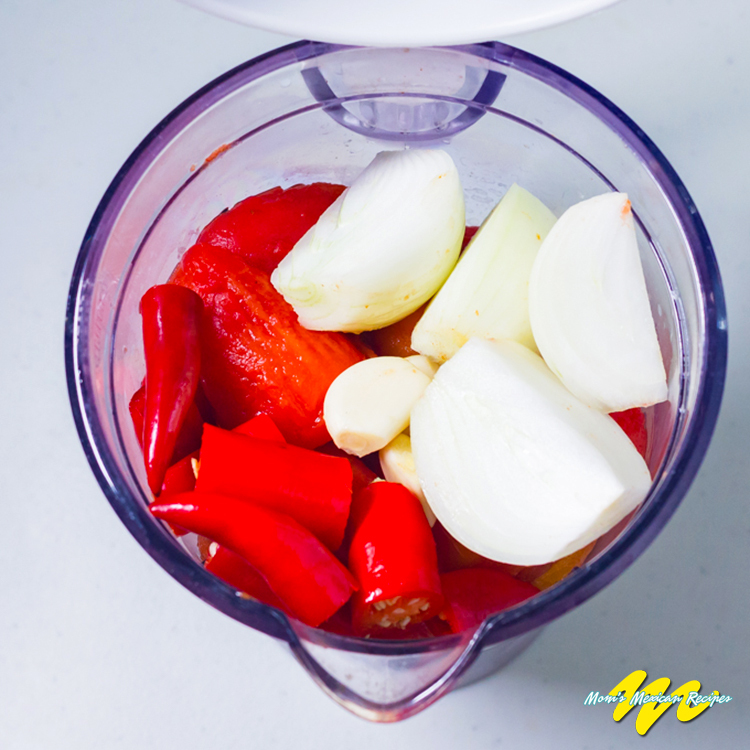 In order to make the sauce, use a blender for the tomatoes, garlic, onion and guajillo pepper. Strain this mixture and fry it in the olive oil. Add the fried tomato sauce to the broth. Partially cover the pot and simmer over medium heat until the vegetables are tender. Raise the heat a little and add the fish cubes. Add the 4 ingredients for flavor, aroma and seasoning and let cook for 1 minute before turning off the heat. For a better presentation remove the onion halved, the 4 garlic cloves and the bay leaves. 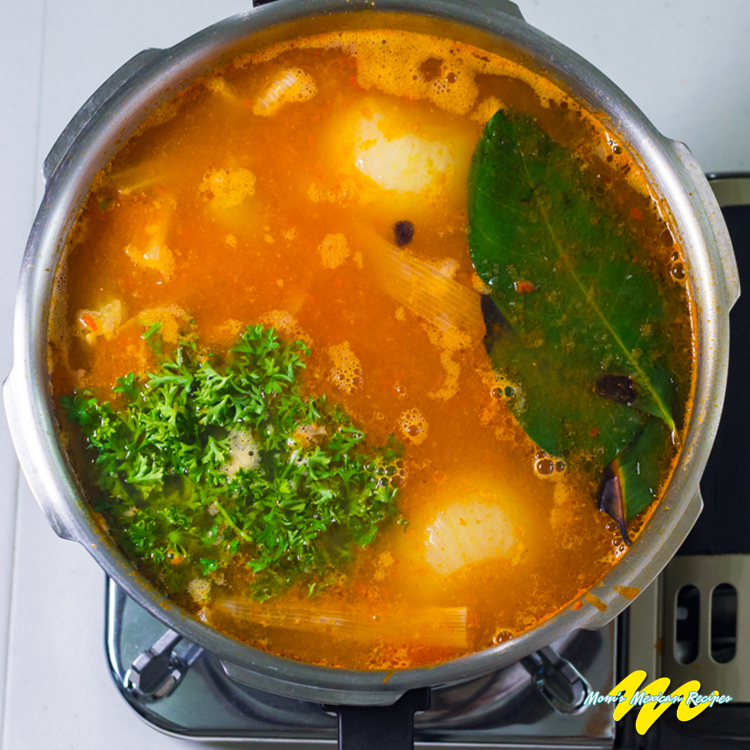 WHAT IS THE SIMPLEST BROTH YOU CAN MAKE TO BOTH WEAVE TOGETHER ALL THE FLAVORS AND PROVIDE RICH COMPLETENESS TO THE SOUP? Many cooks start a great seafood soup or stew with fish stock made from fish bones or heads, vegetables or herbs. But fish bones and head are less and less available these days at fish counters and markets. So, chicken broth is the best substitute. WHAT IS THE BEST, MOST EASILY AVAILABLE VARIETY OF SEAFOOD FOR THE STEW? Always try to buy seafood that is frozen rather than defrosted. Fresh fish that glistens and has a translucency is the freshest; it should have no odor other than that of the sea. Fish with small flakes will fall apart in the stew. Strong flavored fish like kingfish, mackerel, bluefish and salmon would dominate the otherwise delicious balance here, so I suggest to veer away from them. In order to find fresh seafood look in Asian Markets. Their clientele is very demanding when it comes to the fruits of the sea. 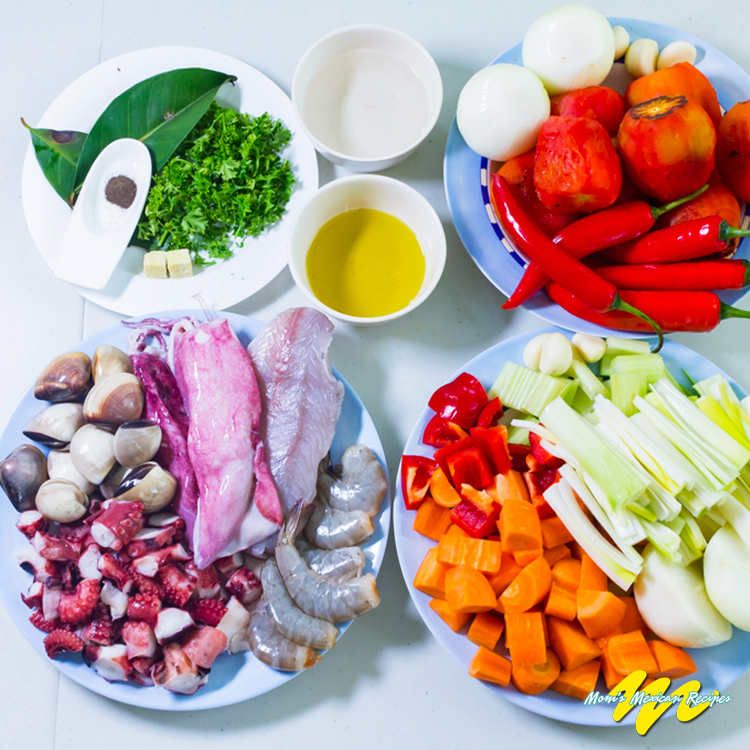 WHAT IS THE RIGHT BALANCE OF INGREDIENTS FOR SEAFOOD SOUP RECIPE? 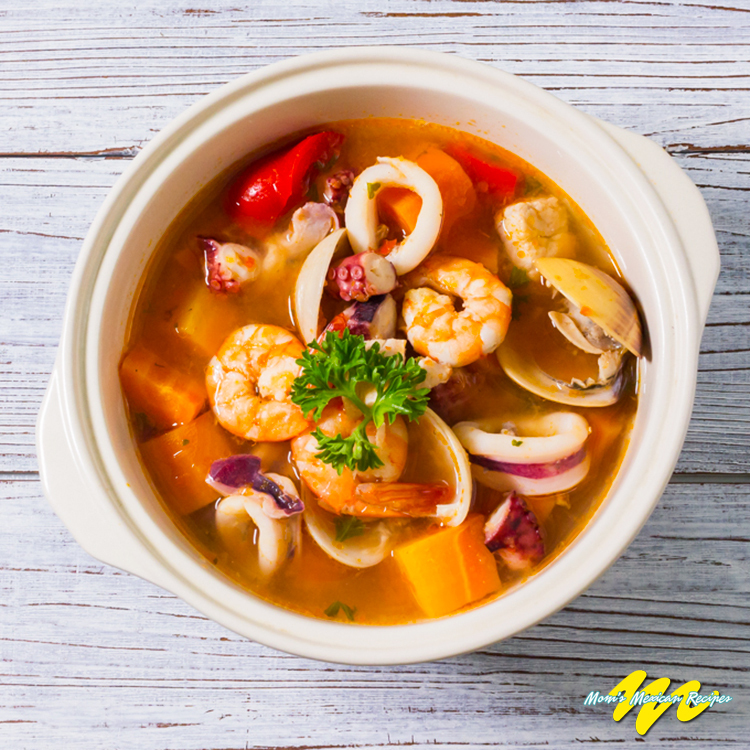 The richest seafood soups and stews are created with a variety of seafood with the addition of some vegetables, tomato, and herbs. And hot pepper, of course, accelerates your enjoyment. One important study has revealed that consumers of seafood in contrast to strict vegetarians- have higher concentrations omega 3 acids (which are good friends to the heart and blood vessel) and significantly lower levels of cholesterol and triglycerides. Besides protecting the heart, seafood is an incredible, rich source of vitamins, for example, contains quite a lot of B12, and essential minerals that are important to good health. Comments, Ideas, and Suggestions about the Recipe? Leave your comment below. Don’t Forget to Like our Official Facebook Page for more Mexican Recipes.